Ecuador's Foreign Minister has announced that the country has suspended Wikileaks founder Julian Assange's Ecuadorean citizenship, which he was granted at the end of 2017. Ecuador has stripped Julian Assange of Ecuadorean citizenship, foreign minister Jose Valencia said on Thursday, after Ecuador withdrew his political asylum in its London embassy. Assange, an Australia native, held Ecuadorian citizenship since 2017. Meanwhile, Marise Payne, foreign minister of Assange’s home country, said he will continue to receive “the usual consular support from the Australian Government.” Consular officers will seek to visit Assange at his place of detention. Separately, the Latin American country’s interior minister accused Assange and WikiLeaks of intervening in Ecuadorean affairs. He said “people close to him, including two Russian hackers,” are living in Ecuador. 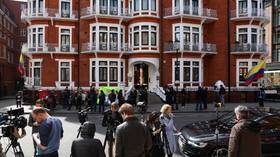 The Metropolitan Police forcibly removed the 47-year-old WikiLeaks founder from the Ecuadorian Embassy in London and arrested him, after president Lenin Moreno said his country took “a sovereign decision” to withdraw political asylum. The arrest was welcomed by the UK government, despite public criticism. Kremlin spokesman Dmitry Peskov said Moscow hoped that Assange’s rights would not be violated. A spokeswoman for the Russian Foreign Ministry accused the UK of strangling freedom.